Can you help reunite a distraught 3-year-old girl with her Jessie cat stuffed toy, which was lost somewhere in Worcester Park - probably on Central Road or at the station. She lost it on Friday 8th (the day the tree came down) and station staff and South West Trains lost property have been unable to help. 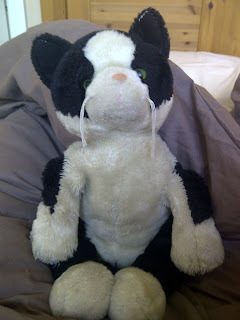 Jessie cat is black and white and very well loved - she is about 40cm tall with green eyes. If you have seen Jessie and can help a heartbroken little girl, please contact the blog.